Providing the plant's leaves and stems with water and nutrients, root systems are crucial to the growth and continued survival of a plant. In turn, the root systems grow as a result of photosynthesis that occurs in the leaves of the plant. 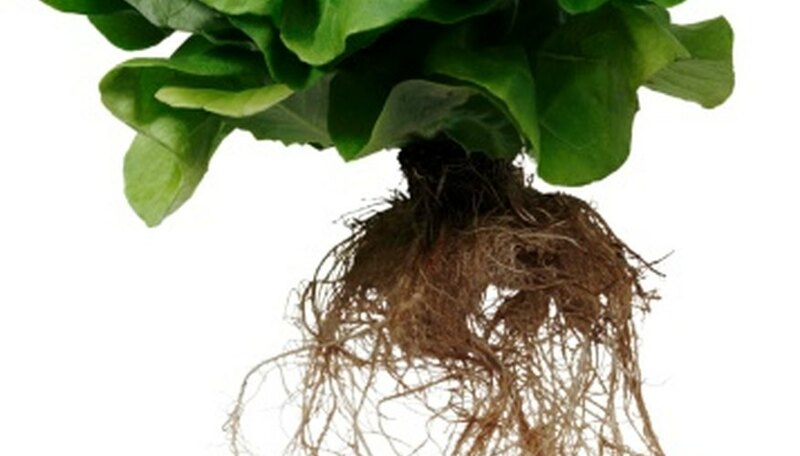 Taproot systems and fibrous root systems both contribute to the growth and health of the plant, each in their own way. A taproot has a main root, similar in appearance to a carrot, which is also a taproot. In most cases, smaller, auxiliary roots grow laterally all along the main taproot. A fibrous root system is a mass of small roots, with an appearance of a mass of fibers. It can resemble a bird's nest or a ball of yarn. The roots are typically only a few inches long and branch frequently, similar to the canopy of a tree. Taproots burrow deep into the soil, their progress halted only by rocks or other impenetrable debris. Some taproots are only a few inches long, like carrots, radishes or parsnips, but taproots of some evergreens can burrow down many feet below the surface. Fibrous root systems grow in their entirety only a few inches below the surface of the soil. Legumes like peas and beans have shallow, fibrous roots systems. Because they exist in the topmost part of the topsoil, fibrous root systems require artificial irrigation more often than plants with taproots, as the top layer of soil dries out first. Taproots break up the subsoil, bringing unused nutrients closer to the surface, where plants can take advantage of them. This also helps improve the fertility of the soil, as more beneficial organisms and nutrients are moved deeper into the soil as it is broken up by the long taproot. This increases the depth of the fertile topsoil, to the great benefit of the plants growing there. Fibrous roots systems grow primarily in the top few inches of the topsoil. Because they form a fibrous mass of roots, they are also good at holding soil together, preventing erosion by wind, water or slopes. To encourage plants with a taproot system to do well, till the soil in their planting site prior to planting. Make multiple passes with the tiller, loosening the soil as deep as possible. Remove rocks or other debris that may hinder the taproots' downward progress. Mulch the soil of plants with fibrous root systems, to help keep them evenly moist and from drying out too quickly. Provide these plants with artificial irrigation if natural rainfall is scarce. Shallow-rooted plants with fibrous root systems are the first to show the effects of a drought. Sharon Sweeny has a college degree in general studies and worked as an administrative and legal assistant for 20 years before becoming a professional writer in 2008. She specializes in writing about home improvement, self-sufficient lifestyles and gardening. What Are the Benefits of Earthworms? What Is the Propagation Method of Kentucky Bluegrass? What Plants Can Be Found in the Benthic Zone? How Do Vascular Plants Transport Water & Nutrients to All Parts of the Plant? What Are the Benefits of Topsoil? Do Worms Affect Plant Growth? What Vegetables Grow Well Together? Do Decomposers Return Nutrients Back Into the Soil?